This is my collection of maxscripts I have made to help with my workflow and wanted to share them in case someone else might make good use of them. All the scripts are copyrighted 2017 by Anders Kjeldgaard Nielsen. No redistribution without explicit permission of the author. To install: Download the zip file and unpack it. To use: Start 3DS Max and go into Customize > Customize User Interface, and select "AKNToolset" in the Category dropbox, and either assign hotkeys or go to Toolbars tab and drag them to a toolbar. This is the toolbar icons related to the scripts. The files are automatically included in the AKN Toolkit zip file, and is only needed if you download the scripts individually, and don't want to assign your own toolbar button icons. If anyone feel the urge to come up with some better icons, please do, as this isn't something I'm not that great at yet. Please note that the numbers is for future scripts. To install: Download the zipfile and unpack it directly into the usericons folder. This script gives the user the ability to quickly adjust the pivot on the selected objects. To use, select objects and use the arrow buttons to quick set the pivot to the objects bounding box min/max size in either axis. 3x3 buttons are set in x,y position, and the 3 buttons to the right is for z position. If you have linked or grouped objects, you can use the "Match Pivot to Parent" match all the childrens pivot match with the top level parent. Use the "Set Pivot to 0,0,0" to set all objects pivots to 0,0,0. Quickly adjust all the selected objects turbosmooth modifiers. To use, select the objects and then either use the "Set iteration" to set all modifiers to a set amount (currently max set to 4), or use the +/- buttons to increase/decrease the amount on the selected objects. If you have more then one turbosmooth on your object, check the box "Only first instance" to only affect the top most turbosmooth modifier. You can also delete all turbosmooth modifiers from selected objects by pressing the "Delete Turbosmooth" button. Use "Only first instance" checkbox to only delete the first one. Use the "Move to top" to move the modifier to be at top of the stack. This is also affected by the "Only first instance" checkbox. This finds objects which has the LOD controller property assigned to them. 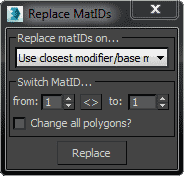 Helpful for finding objects that isn't part of a LOD group anymore as it can crash 3ds max on export. Unfortunately maxscript doesn't have access to the LOD controller, and you cannot delete it via maxscript, so at the moment stuck with finding the objects and then manually remove the LOD property. 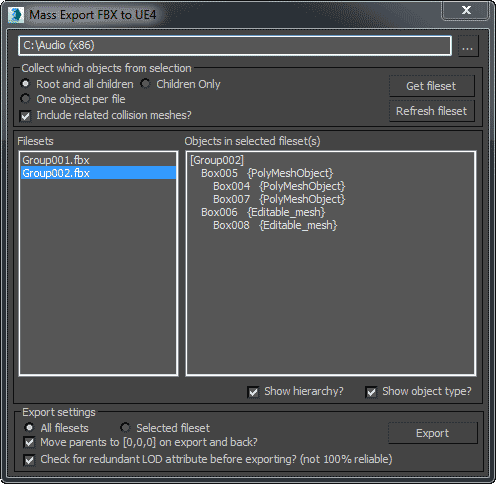 The script take your selection and then sort them into sets by the top most parent, and then you can export them as FBX files. Optionally it will move the objects to 0,0,0 before exporting and back again, and can detect related collision boxes and include them. The script is functional, but I want more features for it. Currently set names are generated from the parent name, but I want to add options to renaming sets, manually add/remove objects to sets, manually create sets and more. At the moment filesets are generated in one go, and will be replaced when using Get Filesets button. Replace material id on selected objects with another material id. Can also set all polygons ids. Requires editable poly modifier or edit poly object, if not, the script will ask if it should add an editable poly modifier. Will find objects which has polygons that doesn't have any smoothing group assigned to them. Select objects and press run script, all objects with missing smoothing groups will be selected and the others will be deselected. Was just an easy way for me to find objects that was missing some smoothing before baking normals. This finds all objects which has a rotation/scaling on them, from selection or whole scene. It also allows the user to apply a Editable Poly modifier and XForm to them and then collapse the stack. All rights reserved by Anders Kjeldgaard Nielsen, 2016-2017.